Yo Radio brings free, premium, streaming radio content to all of your devices. Have questions, check out our FAQs below. Still can't find what you're looking for, contact us for more information. Yo Radio is currently available in the App Store for Apple Devices and the Google Play Store for Android devices. Click here to get the Apple app and click here to get the Android app. Does the app work on iPad? Yes! 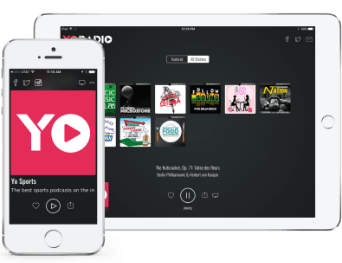 The Yo Radio app is available for iPad – click here to download it from the Apple App Store now! Yes! Yo Radio is always free, always unlimited, and always available in HD quality audio. Can I download the shows/podcasts? Yes! You can download all of the podcasts and shows that stream on Yo Radio after their initial airing. To download and subscribe to any of these shows, go to LineupMedia.fm or select the ‘Podcasts' option from the Yo Radio app menu. Can I suggest content for Yo Radio? Yes, yes and yes! Send all of your suggestions to play@yoradio.com and we will get back to you in short order! Email us at help@yoradio.com or connect with Yo Radio on Facebook, Twitter, Instagram or Snapchat!